God bless you! We welcome you in the matchless Name of our Lord Jesus Christ. A Space Cadet (First Class) writes concerning our recent studies on God's first Bible: "Many scientists and mathematicians observe the heavenly bodies, take measurements and accurately predict their future motions yet miss their great celestial Message painted by our awesome omnipotent God with the sky as His great easel, to elucidate His eternal mysteries that man may know His way, His Truth, and receive His Life. Just this week the full Moon has reflected the light of the Sun more brightly than it has in thirty years, a true sign Christ's end-time Bride is maturing in the unity of the faith with the Token on display, reflecting the Sun of Righteousness in preparation to operate the 'third pull' in the manifestation of the Sons of God for the translation. In our main article we present some background on the vindication of God's prophet William Branham, mainly in his own words, to lay the groundwork that will enable us to explain a comment from last week's Newsletter in next week's "exciting episode." Otherwise our last Newsletter might have grown to a small book. March 22, 2011 If you're a leader who is looking for an expensive means of losing power, hire Maj. Gen. Israel Ziv at his firm Global CST and he'll arrange for your downfall. Just ask Libyan strongman Muamar Ghaddafi for a recommendation. Quoting reliable Israeli sources Yediot Ahronot and Inyan Mercazi, I strongly contended that a desperate Ghaddafi hired Ziv's Israeli firm to supply him with a mercenary force to defeat the rebels' ragtag army on the verge of ousting him from power. (See Newsletter 676). Since then, details of the plot have emerged from the dark. Attending the fateful February 18 meeting were Netanyahu, Barak, and Lieberman. They heard assessments from IDF intelligence chief Gen. Aviv Kochavi and Chairman of the Division of North Africa in the Foreign Ministry, Shalom Cohen, that if Ghaddafi falls, a radical Islamic regime would follow him. Based on this unlikely assessment, the Prime Minister decided, supposedly on behalf of the Israeli people, to bail out Libya's leader with a well trained and equipped army of African guns for hire. He contacted Gen. Ziv who arranged a meeting with Ghaddafi military representatives in the Chadian capital N'djamena. Joining them were two reps from the Israeli government, former Israeli Foreign Minister Shlomo Ben-Ami, and Gen. Yossi Kuperwasser. There, a deal between Israel and Libya was cut. There should be no shock that Ghaddafi agreed. He had two choices; be overthrown or be saved by Israel. Naturally, he chose the latter even though the terms were tough. Global CST would supply tens of thousands of mercenaries for 5 billion American bucks. After they slaughtered the last of the rebels, Israel would be granted rights to explore and export Libyan oil hushhushedly and Gen. Ziv would be permitted to operate his army from Libyan soil to spread its unique talents at saving dictators throughout Africa. General Ziv is on the payroll of Counterterrorism International and is member of the Task Force on Future Terrorism (FOTFF), created in June 2005 by the Office of Homeland Security of Israel? No, of the USA FOTFF operates under the orders of then-Secretary Michael Chertoff and Lee Hamilton. When told that he would be moving fast against teenagers, his infamous reply was that he would take that into consideration but he had his "limits." IDF reservists who helped to train Georgian troops said Sunday that they had been unable to contact soldiers who they trained up until a few months ago, but declared that the recent hostilities came as no surprise. Speaking to reporters, the reservists said the bases used to train the troops had been bombed by Russia even though they weren't located in the area where the battles are taking place. One reservist identified as L told Haaretz that he was hired by Global CST, owned by Maj. Gen. Israel Ziv, and Defense Shield, owned by Hirsch, about a year ago, right after he left the army. He had served as a combat officer in an elite unit, and he got the adventurous offer through his commanding officers. "It looked interesting, relative to Israel; the money was excellent, too," he said. After betraying fellow Jews and Georgians, Ziv turned his sights on Guinea in 2008, training the troops of dictator Capt. Moussa Dadis Camara. By the next year, the Israeli-trained troops turned their new rifles on a soccer crowd, killing 158. Ziv's benefactor, Camara, left Guinea for medical treatment in Morocco, and has not been permitted to return home. And now, it's Ghaddafi's turn. "There are no historical documents to verify the story of Purim. Some scholars think that the events in the Megillah did not occur, but rather that they are based on stories related to the Babylonian gods such Ishtar (Esther?) and Marduk (Mordechai?)." In some communities it was not enough to drown out Haman's name with noise. People also made effigies of Haman and burned them. This practice led to instances on Purim when Jews made and burned effigies which resembled new enemies, helping them to vent their hate and frustrations" (Dalin Renberg, Complete Family Guide to Jewish Holidays). In the festival of Purim on February 28, 1991 Jewish US President George I ordered 150,000 fleeing surrendered conscript Iraqi soldiers slaughtered with fuel air bombs and buried by US Military bulldozers in mass, unmarked desert graves, many of them still alive. As in the days of Esther, the catastrophe provoked by US Ambassador April (Haman) Glaspie had been averted and the massacre in Kuwait was propaganda. Why then this call for bloodshed, if not to extend Greater Israel from the Nile to the Euphrates? The final installation of the Israeli State as the dominant Middle-East power will send the extremely negative signal to Islamic extremists and countries in the region and elsewhere needed to provoke and unite them into the City's long-planned World War III against political Zion. In the festival of Purim on March 19, 2003 Jewish US President George II appeared on TV and issued a 48-hour deadline for President Saddam Hussein and his family to leave Iraq during the celebration of Purim. Once again the pretext was propaganda, and the massacre planned and executed by 'the City,' whose colonial air forces had bombed Iraq for the previous 12 years while its UN enforced economic sanctions and a "no fly zone" against the hapless nation. In 2011 the celebration of Purim began at sunset Saturday, March 19, and ended at sunset March 21 wherein Jewish US President Obama, leading an alliance of anti-Christ crusaders from behind fired 'humanitarian' assistance upon hospitals, homes, schools, power plants, ports and infrastructure in Libya as pictured. "Change you can believe in"? His objective is to relieve Libyans of the burden of oil resources, of excellent FREE education, healthcare and housing unknown in "the land of the FREE"provided by the prosperous civilization developed under 42 years of Gaddafi's rule. "Anglo-American propaganda portrays Qaddafi as a kleptocrat. In reality, Libya is one of the most advanced developing countries, ranking 53 on the UN Human Development Index, making it the most developed society in Africa. Libya ranks ahead of Russia (65), Ukraine (69), Brazil (73), Venezuela (75) and Tunisia (81). The rate of incarceration is 61st in the world, below that of the Czech Republic, and far below that of the United States (1). Longevity has increased by 20 years under Qaddafi's rule. Qaddafi, while suppressing political challenges, had shared the nation's oil income better than the rest of OPEC." "Obama, faced by the military collapse of a CIA force in Libya, has ordered such bombing, opening a second phase of the present US debacle. The rebel region of Cerenaica has long been the scene of Moslem brotherhood agitation against Qaddafi, much of it fomented from across the Egyptian border with US assistance. After the failed 1995 assassination attempt against the Libyan leader reported by MI-5 defector David Shayler (for which MI-6 paid £100,000 to an al Qaeda subsidiary), eastern Libya was the scene of a protracted Islamist insurrection. In the wake of events in Tunisia and Egypt, it has become clear the CIA has stipulated a worldwide alliance against existing Arab governments with the reactionary and oligarchical Muslim brotherhood, which was created by British intelligence in Egypt in the late 1920s. Al Qaeda of the Islamic Maghreb (AQIM), another CIA front, is trumpeting full support for the rebels on its website" (tarpley.net). According to the Russian military CIA agent Col. Gaddafi's supposed airstrikes against his people did not take place. "US interference in North Africa redefines the geopolitics of an entire region. It undermines China and overshadows the influence of the European Union. This new redivision of Africa not only weakens the role of the former colonial powers (including France and Italy) in North Africa, it is also part of a broader process of displacing and weakening France (and Belgium) over a large part of the African continent" (globalresearch.ca). "A 'humanitarian war' would be 'good for business.' It serves the interests of the institutional speculators, it contributes to a further process of appropriation of money wealth. Financial institutions with prior knowledge or intelligence of events in Egypt and Libya have already made billions of dollars in speculative gains in the futures and options markets for crude oil. These global financial and banking institutions, which 'placed their bets' several months ago, have 'a vested interest in war.' The greater the turmoil and disruption of the crude oil market, the greater the speculative gains. Short term speculative gains due to market volatility are also part of this process. Foreknowledge of the sequence of political or military events and how they affect markets as well as control and/or manipulation of financial news pertaining to these events are an essential part of the betting process" (globalresearch.ca). Brother Branham said, "This America is the prostitute of the nations. That's exactly what she is, and she's going to be worse than ever now. She's coming to her end. The Bible speaks of her doom, tells how she's going to be: America: lowdown, rotten, filthy, no good. That's exactly right. She's been a great nation. She's carried the Gospel message. What makes her the way she is? Because she's turned down the Gospel message and rejected the truth. She's horrible. She's got it coming; don't worry. I seen it in the vision as THUS SAITH THE LORD. It's coming. She's going to pay for her sins" (Revelation, Chapter IV, Part 3, p. 661:87). The United States of America is the apostate (once) Protestant image to the Judaeo-Catholic beast of Rome. She does not realize she is the forerunner of the Devil-incarnate beast, ensuring: "He will extend his dominion over many countries, and the land of Egypt shall not go free; he will gain control over Egypt's treasures, gold, silver, and over all the precious things of Egypt: and the Libyans and the Ethiopians shall be his servants." So much for the 'democracy' and 'freedom' these deluded people hope for. So it will not be long before "Tidings out of the east and out of the north shall alarm him, so that he will return with great fury to exterminate and utterly destroy many. And Rome will pitch his palatial tents between the sea and the glorious holy mountain; yet he shall come to his end with none to help him" (Daniel 11:42-45). The US is preparing the way for Universal Judaeo-Roman rule. We are very close to the fulfillment of Ezekiel 38 and 39. Yemen and the United Arab EmiratesSheba and Dedan of Ezekiel 37, like other nations of the Middle East, are currently plagued by the spirit of Laodicea, which is Communism disguised as democracy offering 'rights' to the people when in fact the objective is to bankrupt and enslave those nations and transfer their fabulous wealth into the hands of international banksters who are committing genocide on the Libyans by depleted uranium. Gaddafi informed and warned his people about our Hegelian sham democratic system, and explained that JFK was assassinated by Israel. Comment: Ron Paul condemns Obama for bypassing the Constitution and Congress to fight an illegal war against Libya. "The mystery of lawlessness is manifest in the 'City of London,' her US and NATO puppets; the Holy Spirit will only restrain until He departs this earth in the translation of Christ's Bride" (II Thessalonians 2:7). March 18, 2011  Magna BSP set up the security system about a year ago at the facility, which suffered extensive damage after the recent earthquake and tsunami, with particular concern over radiation leakage from the reactors at the site. Among the 50 Japanese workers who have remained at Fukushima amid the unfolding crisis, in an effort to bring the facility under control, are two individuals who were in Israel about three weeks ago, where they underwent training to transfer the operation of the security system to the Japanese themselves. . . Although there is no access to the area, Siboni said the cameras from his company's security systemwhich were installed high upwere probably not damaged and likely captured the post-earthquake explosions at the site, as well as the impact of the tsunami. Comment: Shades of the "five dancing Israelis" on 9/11, with Hollywood's prescient chutzpah the scenario of a HAARP-induced earthquake and the of a nuclear power plant was filmed in advance, like 9/11, Hurricane Katrina, the preparation and publication of The Protocols of the Learned Elders of Zion and the military blueprint for World Wars I, II, and III. You can't say we were not warned! As I write the US National Tsunami Hazard Mitigation Program Warning Coordination Subcommittee has scheduled a Pacific Tsunami Warning Exercise for today, March 23, 2011; UNSECO runs its Caribbean Tsunami Warning Exercise. 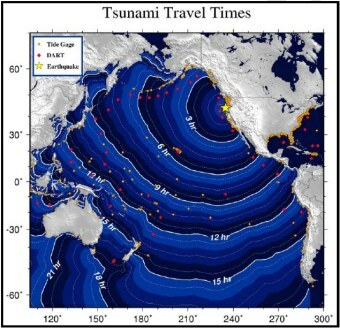 Coming just days after the catastrophic earthquake and tsunami in Japan, is the timing of these pre-planned exercises in conjunction with 28 states and territories 'prescience,' or just another 'coincidence'? You will recall that NORAD was simulating an 'exercise' on 9/11, and the British were simulating 'the real thing' on 7/7. Or is this a psyoptimed to correspond with the perigee-syzygy of the Earth-Moon-Sun system or "supermoon"and designed to manipulate a gullible public by fear? Bearing in mind the soon-coming earthquake that will sink Los Angeles and a 1,500x300-400 section of earth's crust, causing tidal waves to sweep the world, and the impending National Level Exercise. NLE2011 will be an operations-based exercise centered on the scenario of a catastrophic earthquake in the New Madrid Seismic Zone, encompassing four FEMA Regions (IV, V, VI and VII) and eight Central US Earthquake States: Alabama, Arkansas, Kentucky, Illinois, Indiana, Mississippi, Missouri and Tennessee. NLE2011 will exercise initial incident response and recovery capabilities, to test and validate existing plans, policies and procedures to include the New Madrid Catastrophic Plan (under development). NLE2011 will be conducted from May 16-20, 2011. However, the PACIFEX11 exercise simulates an earthquake located in the Cascadia subduction zone off the North American Pacific Northwest coast which intersects the San Andreas Fault. We studied the Cascadia subduction zone in Newsletters 606 and 657. Food for thought since our nations are controlled by international criminals to whom the ends justify the means and who plan to reduce global population to between one and two billion. The "Shoe bomber" slipped by Israeli security in Paris; the "Crotch bomber" slipped through Israeli security in Amsterdam; an Israeli security firm held the contract for the London Underground during the Tube bombings, Israeli 'security' firm ICTS helped provide 'security' at Russia's Domodedovo Airport, and all 9/11 airports were serviced by one Israeli-owned company. What a coincidence! Researchers at the Idaho National Laboratory (INL), which is overseen by the US Department of Energy, may have passed critical information to Israel about vulnerabilities in a system that controls Iran's enrichment plant at Natanz: information used to create and test the so-called Stuxnet worm unleashed in a joint cyberattack on Natanz, according to The New York Times. The report, based on anonymous sources, is sparse on detail but asserts that in 2008, INL worked with the German firm Siemens to uncover vulnerabilities in its industrial-control system. Stuxnet was then created to exploit those vulnerabilities and was lab-tested at Israel's nuclear facility in Dimona. The Dimona facility, according to the Times, has been involved in a joint US-Israel operation for the last two years to thwart Iran's production of enriched uranium and forestall its development of a nuclear weapon. Israel attacked and destroyed reactors in Iraq and Syria, and surveillance footage; code clues indicate Iran's centrifuges were attacked by the Stuxnet virus made in Israel. Did a US government lab help Israel develop Stuxnet? The computer malware sabotaged Iran's Uranium Centrifuges, and has been found in Japan where it is claimed it has infected the Fukushima reactors which use Seimens controllers. This model calculation demonstrates the possible course of radiation clouds from Fukushima into the atmosphere on a global scale last Friday. The US military is transferring 200,000 service personnel from Japan to the US West Coast which is already receiving radiation. It is likely the Stuxnet virus prevented the safety devices from shutting down the Fukushia reactors. Nuclear apocalypse in Japan lifting the veil of nuclear catastrophe and cover-up. The global manipulators are seeking unthinking control over world population by fear, and over political, religious and business leaders by greed. Charles Wesley preached on earthquakes: "The Lord was in the earthquake, and He put a solemn question to thy conscience: "Are you ready to die? . . . Is your peace made with God?" If the earth just now were to open its mouth and swallow you up, what would become of you? Where would you be"? Watch footage you have not seen before. When the natural frequency of the audio is not tampered with, an explosion can clearly be heard just before WTC7 collapses into its own footprint. The FBI cleared five Israelis of any involvement in an event "they had come to document." The 9/11 Commission Report made no mention of "dancing Israelis," or the collapse of WT7; NTSB did not forensically identify the aircraft wreckage, serial numbers of their Flight Data Recorders have been withheld, and the missing Pentagon surveillance videos are still missing. Do we want to be governed from Canberra, or from Tel Aviv? The most dangerous, deceitful, destructive nation on earth is apartheid Israel itself. Comment: On September 23 1979 Isser Harel founder of the Israeli Mossad told Zionist Jew non-Christian self-styled 'evangelist' Michael D. Evans: Terrorism will come to America, the attack will take place in New York and it will be on its tallest building. Harel was behind the failed LAVON AFFAIR of 1954 in which Egyptian-Israeli agents placed bombs inside British and American targets hoping Muslim groups would be blamed. The FBI-coordinated fake WTC attack in 1993 was followed eight years later by a meticulously planned, and extremely lethal attack which killed thousands. How did Isdsar Harel know what the "Arab terrorists" planned more than two decades before 9/11? WHO really benefited? March 18, 2011  Bernard von NotHaus, 67, was convicted today by a federal jury of making, possessing, and selling his own coins, announced Anne M. Tompkins, US Attorney for the Western District of North Carolina. Following an eight-day trial and less than two hours of deliberation, von NotHaus, the founder and monetary architect of a currency known as the Liberty Dollar, was found guilty by a jury in Statesville, North Carolina, of making coins resembling and similar to United States coins; of issuing, passing, selling, and possessing Liberty Dollar coins; of issuing and passing Liberty Dollar coins intended for use as current money; and of conspiracy against the United States. . . Comment: Don't even think of messing with Mr. Rothschild. Don't think! You are cordially invited to an Easter Convention with Bible Believers' Church in Owerri, Nigeria, from Good Friday, April 22 to Easter Sunday, April 24. The theme of ministry will be "Come up hither"! Revelations 4:1. Please email endtimemessage@gmail.com, call or SMS +234-803-7478-247 to confirm your attendance and reservations. Registration fee is N2,800. [Following a revival meeting on June 11, 1933 when Brother Branham was baptizing the seventeenth of 500 penitents in the Ohio River before 5,000 witnesses, the pillar of Fire appeared above him in the form of a Star, and a Voice said, "As John the Baptist foreran My first Coming, your Message will forerun My second Coming." In Revelation 1:16-20, "Jesus held [a constellation of] seven stars in His right hand . . . which were the angels of the seven Church [Ages]." Brother Branham was the seventh angel, the messenger to the Laodicean Church Age (1906-1963). Once again, the unchanging God with unchanging ways has sent a vindicated prophet led by the pillar of Fire, which is Christ, the Angel of the Lord (Exodus 3:2-22; Acts 9:1-6). We live in the third and final exodus wherein Christ is calling His Bride out from the apostate churches into oneness with the Word for the manifestation of the Sons of God and the translation (Revelation 10:4-7; Ephesians 4:13; Romans 8:19; I Corinthians 15:47-56)]. In "Reproach for the Word," preached on December 23, 1963, Brother Branham said, "Wished I had time, Fred, for you to read that. You got it in your pocket? I guess many of you seen it in the magazine. The thing that the Holy Spirit spoke down yonder at the river thirty-three years ago, they just dug it up December the 9th proving it, that astronomy, how in Jupiter and them stars in their constel. They've got an old astronomy calendar, markings there that they dug up. And it's exactly that time that this constel came in and the constellation of these stars, and throwed right down towards Babylon, and the wise men brought it down. You remember, they crossed their orbits, low swung, billions of light years apart again. And those Jewish wise men that was up at Babylon, they seen that constel come into that constellation, them stars, three of them moving together and making that one Morning Star. And they knowed that by the Word of God, that that was the time, when them stars come together, that the Messiah was to be on earth. That's the reason they started, "Where is He, born King of the Jews? Where is He? Somewhere, for when those starstheir celestial bodies become into this one great celestial body here, when them three's moves together, Messiah will be on earth in that time. And when they moved into their orbits, them men knowed that the Messiah was on earth. They were masters in their field. They were great men. They were masters in their field of religious science. They was watching the religious side of it, and they seen those stars move out yonder: Jupiter and Saturn, and them move into their line. And they said, "We know that Messiah's somewhere; so He must be in Jerusalem, because that's the head-place of the religion of the Messiah. That's their headquarters. That's the denominational headquarters. That's where the great ecclesiastical group sets." And on camels they went, two years, down across the Tigris River, and through the swamps and jungles, journeying, going to the city, hearts filled with joy. They knowed when that stars was hanging in there. . . And even the astronomers say today, if they actuallythem stars come into that place again, it would make one star from where they was standing looking. But they had to be standing from that place to see it. Amen. Amen. It depends on where you're standing. It depends on what you're looking at. Yeah. So they seen it, and they followed it, and they was right in line. No matter where they got, it was right in line with them. It led them. See? That's where you got to get all the Scriptures lined up, everything, then stay in that line with the Scriptures. That's the only way. It'll lead you right straight to Him, certainly will. Now, notice. Here they come, crying, "Where is He born King of the Jews?" Into Jerusalem, the Star led them right there, right straight to the denominational headquarters. But when they turned aside for it, the Star left them. Into the city they went, up and down the street. They thought the city would be full of the joy of God. Up and down the street with joy they went screaming, "Where is He that's born King of the Jews? We saw His star when we was in the east, and we've come to worship Him." Remember, the star. . . They went westward; they were in the east. "Westward leading, still proceeding. Lead us to. . ." Well, Babylon and India lays east of Palestine, kind of southeast, and they were going westward. "Westward leading," you know that song, "still proceeding; Guide us to that perfect Light." See? The wise men was coming west, leaving the east, going west, and they seen that star. Now, if they was in the west looking backwards, they didn't see it. See? When they got there, it guided them right there, then it left them; and they thought, "Here it is. The Star has left, so here it is. They're in the city." So, oh, my, they said, "Everybody was just a-singing and happy; the glory of God's lit up everything. So here we are. We know that our achievement. . ." As he watched that constel. . . No one, no master could come up there and pull them stars together. And we know when thatwhen that stars come into that heavenly body, that's the time the Messiah's on the earth. The Messiah is on the earth. And ever so many hundred years they pass their constel again. And then there's a gift comes to the earth. Notice, the Messiah is on the earth, when thatwhen that group of stars got together. And they knowed He was there. So they went to the headquarters of religion, and begin going, saying. . . Up and down the street they went on these camels, "Where is He? Where is He? Where is He that's born King of the Jews. We saw His star in the east; He's here somewhere. Where is He? Where is He? Where is He?" What a reproach. They went to the chief priest, and he might've said, "What's the matter with you fellows? Why, you bunch of fanatics. . ." See, what a reproach upon their scientific achievement by the power of God. They seen His star, and they were wise men, smart. They were in the field of religious science, and they knowed when them stars got there, Messiah was somewhere. And here the place that should've knowed it, knowed nothing about it (Reproach for the Word, p. 28:3 - 30:2). The Magi were Israelites whose forefathers had been taken captive to Babylon by Nebuchadnezzar, they were students of God's first Bible who believed Jacob's prophecy of Genesis 49:10: "The Sceptre will not depart from Judah, nor the ruler's staff from between Judah's feet, until Shiloh[the Greater Solomon, brings peace and rest in the millennium]He to whom it belongs comes, and to Him the people shall be gathered and obey." The visions Jacob was reporting in real time foretold the destiny of each of the tribes "in the last days" or Messianic age of redemption and completion. They would all be denationalised and lose their individual identities, but Judah would survive as a tribal name and his brethren (and their impersonators) would identify as "Jews," whether an independent or a subject people. So that today no Israelite knows to which tribe he belongs. Judah, too, will disappear when the elect Israelites are converted to Jesus Messiah as Christians on "one day" in Daniel's Seventieth Week (Isaiah 9:14; 66:8; Zech 3:9; 12:11). The Hebrew Magi were primarily following the further illumination of the prophet Balaam's vision of Numbers 24:12-25, also reported in real time: "I see Him, but not now: I behold Him, but not nigh: there shall come a Star out of Jacob, and a Sceptre [or King] shall rise out of Israel, who shall crush the corners of the head of Moab and destroy all the children of the buttocks [or extremitiesall the enemies of Israel once the nation is redeemed], in the end of days" (verse 14). The celestial star led the magi to the infant "King of the Judahites . . . the Star out of Jacob" just as the earthly "star" of Revelation 1:1, 16-29, 3:14 and 10:7, William Branham, has led us to Him at His second of 'parousia' Coming according to Word of the Angel of the Lord spoken over the Ohio river in 1933, "As John the Baptist foreran My first Coming, your Message will forerun My second Coming." Brother Branham explained, "These signs given by the Lord is given only to believers. The unbelievers never see it. They go right over the top of them, and they don't see it. And now, just as sure as it is that an Angel of God could stand on this platform tonight, just as true as I'm looking at you, and I could be looking at it; or you could be looking at it and I couldn't see it, or I could look at it and you couldn't see it. . . Now, you know that's Scriptural; that's exactly the truth. They saw. . . You know Paul fell down, but none of them could see that Light (Acts 9:3-9). That Light was right there when John stood there before the multitudes, and thousands out on the bank there of clergymen, and sages, great men. And John said himself he bore record of seeing the Spirit of God descending like a dove and come down upon Him, and a Voice saying, "This is My beloved Son in Whom I am pleased to dwell." And nobody saw it but John. See? It was just for him (John 1:19-34). Did you notice how vivid the sign for the wise men? They looked, there was. . . They were Hebrews. They wasn't really Indian astronomers; they were Hebrews; because they were up there in that country studying astronomy to finish their education. And when they looked towards Jerusalem, and knowing that they saw those three stars from each one of their birth path, of Ham, Shem, and Japheth, of which race they come from, each, and they seen them stars in their birth path. That was a sign to them, that when those stars were in line, the Messiah was on earth. Oh, my. No wonder they came, "Where is He? Where is He that's born King of the Jews? We've saw His star in the east and have come to worship Him. Where is He?" They knowed that that infant Messiah was laying somewhere, because God gave them a sign of the time, that God and man were uniting together. What a unity, when God united Himself in a human body. The principle, the greatest of all the unitings that ever was done, was when God united with man, and left His great strain of being God and stretched forth His tent, and took in humanity, and become one of them through unity. That brought peace between God and man forever; how thankful we are. And signs were not sent. . . Now, just think, every man, and all the astronomers; the people them days, their clocks was the stars. There was a watchman went on top of the tower, and he would get up there and watch. And he seen when a certain stars was in certain constellations, as they were passing, he knowed what time it was. You remember in the Scriptures, "What time is it watchman?" And the watchman come back and told him in what hour it was. See, they kept time by the stars. Now, isn't it strange that these stars were exactly in line for three men and nobody else saw it? See? Just exactly in line. . . Now, you can be so in line with the Scripture. See? When those stars become in unity, united themselves together in this constellation, three men were also united at the same time. And you can be so united with God in His Word, until these things become realities, and you can see them, and know that they are true. See? The sign of the time, you might look right over top of it, say, "Aw, nonsense!" But to you it isn't nonsense. To you, you're united with the Word, and here it is. Then it's absolutely right, Brother Pat, when you see this sign unite with the believer. And that's who I'm addressing this to, is the believer, for the unbeliever'd never see it. And what a rebuke it would be if He was on earth today to many of our clergy today, who cannot read this sign: the signs that we're reading daily here at the Tabernacle, and seeing the things. And others are reading it and seeing the handwriting on the wall, and yet many just ignore it, and don't even see it at all. It's nothing to them at all; they don't notice it (The Uniting Time and Sign, p. 9:37  11:43). Brother Branham preached "Is this the Time of the End, Sir," on December 30, 1962 just before he relocated west from Indiana to Arizona for the opening of the Seven Seals. There he was caught up from Sunset Mountain into a constellation of the theophanies of the Church Age messengers or "stars" of Revelation 1:16-20 and the four living creatures (who represent the Bride of all Ages) on March 8, 1963, as foreseen in visions recounted to his church in December 30, 1962 (see Newsletters 632 and 633). We must follow him into this pyramid of "that which is complete"the fullness of the Word (I Corinthians 13:10) through the Seven Thunder mysteries of Revelation 10 which are the revelations contained in the Seven Seals (William Branham, An Exposition of the Seven Church Ages, p. 327:1). When John was caught up in Revelation 4:1-2 to see "things which must come to pass after the close of the Laodicean or seventh Church Age" he represented you and me, Christ's end-time Bride. "If you'll tell the truth. . . You may be laughed at for a while; you may be misunderstood for a while; but God will vindicate that, that it is the truth, if you'll just stay with it. Just hold on. Might take years, like in Abraham and others, but He will always make it the truth. When that Angel there. . . And I suppose, besides my wife, there's people here tonight from thirty years ago that was standing close when that come down. . . Is there anybody in the audience now that was there when the Angel of the Lord, that come down on the river the first time, before the people, raise up your hands. Yes, there they are. See? Now, I see Mrs. Wilson raised up her hand. She was standing there. My wife there, she was there. And I don't know who some of the rest of them is that was standing on the bank here, before many, many people, when I was baptizing at two o'clock in the afternoon, and right out of the brassy skies, where there hadn't been rain for weeks, here He come with a roar. He said, "As John the Baptist was sent forth to forerun the first Coming of Christ, you're sent forth with a Message to forerun the second Coming of Christ." Many men, from businessmen of the city was standing on the bank, asked me what it meant. I said, "That wasn't for me; it's for you, I believe." On it went. And when that Angel left, if you'll remember, he went westward as He went up, right out, up over the top of the bridge, and went westward. Later on I met an astronomer, which is a Magi. And they told me of a constellation of stars that had come together at a certain constellation when the wise men in Babylon saw down towards Palestine this three stars in a constellation. You've heard me tell it many times. Do you know that's proven these last couple of weeks to be the truth? Brother Sothmann, you have that paper with you tonight, ever where you are? It's in the paper, a sheet of a Sunday paper, December the 9th. The reporter went over there, and they dug up all these things. And we're actually living now, proven, that we're, this year coming up is nineteen hundred and seventy: seven years out of date by dug up rocks, and proved that it's wrong. It is later than you think. I didn't see Brother Fred, somehow. Brother Sothmann, are you here? Do you have the paper with you, Brother Sothmann? (You have. . . He has the paper). Maybe tomorrow night I'll have you read it. We haven't got time tonight. So you can see and watch, exactly. . . Those magis, Jewish magis, up in Babylon, studying the stars, saw those stars fall into their constellation, and when he did, they knew that Messiah was on earth. And here they come into Jerusalem singing (two years' journey), "Where is He that's born King of the Jews?" Up and down the streets they went. And why, Israel laughed at them. These bunch of fanatics. They never knowed nothing about it. But the Messiah was on earth. And now. . . You know the rest the story, what they said. Now, we'll read that tomorrow night. Now, coming to this, that the visions don't fail, because they're from God. And all along the journey has been something pulling me, tugging at me. Then when that Magi told me these things when I was just a boy, game warden (or before that, I believe it was), about these things, and it scared me, because I was afraid of what the Magi was. But later on I found out that the magis of the Bible was right, because God declares it in heaven before He declares it on earth: watching those heavenly bodies (Genesis 1:14; Psalm 19:1-6; Revelation 1:7, 14; Daniel 7:9; Matthew 26:64; Acts 1:9-11). "God is no respecter of person of all nations," said Peter. Now, "But those who fear Him in all nations God accepts." And then . . . I tried to give the thought up. But, oh it would take hours to go in, how they constantly it moved that way, moved that way, but I was scared of it. This Magi said to me, "You'll never be successful in the east." Said, "You were born under a sign." And he said, "You. . . that sign, that constellation, when they crossed way out in there, the day of your birth, they were hanging westward, and you must go westward." And I said, "Forget it." I had nothing to do with it. And all along though, still that didn't take it out of my heart. Then, when I was up there that night about these visions, I couldn't understand. My Baptist brethren told me that was of the devil. And then when that Angel appeared, He absolutely throwed it into the Scripture, and said as it was then, when the priests were arguing about things, not knowing nothing about what kind of coats they should wear, and clothes, and everything, and arguing about their differences, the magis was following the star to Christ. When the preachers said that Jesus was an impostor, a Beelzebub, a devil raised up and said, "We know who You are: the holy One of God. Why are You coming to torment us before the time" (Matthew 8:29; 12:24-27)? When Paul and Silas came down preaching the Gospel, a little fortuneteller, setting on the street . . . And the preachers of that country said, "These men are impostors. They tear up our churches, and so forth, turning the world upside-down with their corruption." But what happened? That little Magi, that little fortuneteller, said, "These are men of God that tell us the way of life" (Acts 16:16-19; Is this the Time of the End, Sir, p. 74:9  76-8). [Nowhere in does the Bible mention the number of magi, that Eve ate an apple or that Joseph was a carpenter, and while sleeping virgins argue over their differences the wise virgin have followed the star to Christ's second or 'parousia' Coming. Here is the article published in PARADE Sunday Magazine on December 9, 1962 (the emphasis is ours)]. Down through the ages, skeptics have questioned the historical accuracy of the Gospel story, dismissing much of it as pious legend. But new light is breaking through the mists. The spade of the archaeologist and the research of the scholar have turned up evidence corroborating the Scriptures. There have been soul-stirring discoveries: an ancient account of a heavenly phenomenon that fits the Biblical description of the Star of Bethlehem; a Roman cornerstone bearing the name Pontius Pilate; a piece of inscription which confirms a disputed detail in St. Luke's account of Our Lord's birth. From St. John's text, archaeologists have even located the pavement where Jesus stood as He confronted Pilate on the day of His Crucifixion. PARADE sent me to the Holy Land to examine these findings, to assess the battle between the believers and the scoffers. I talked to prominent archaeologists and inspected their diggings. I visited churchmen who now preside over the shrines which mark the milestones in the Saviour's life. I interviewed men who have devoted their lives to the translation of ancient manuscripts. All agreed that the Gospels, in essence, are historically true. I wandered over the gnarled mountains and sweeping valley where Jesus sought to change men's hearts. From Bethlehem to Galilee, the land appears as eternal as His word. The Jordan River is still the giant twisting, life-giving serpent of old. The Sea of Galilee, encircled by mountains, it still a burnished mirror of the sky above. And its waters today are fished largely by brothers who haul in their nets as did the Biblical brothers, Peter and Andrew, James and John. The lake's peace can also be shattered by sudden storms, caused by cool air rushing down from the highlands as warm, moist air rises over the lake. Then Galilee is lashed to fury, and the fishermen hurry for the shore. They talk of the times they almost perished, recalling the words of St. Luke: "And there came down a storm of wind on the lake, and they were in jeopardy. And they came to him, and awoke him, saying, Master, master, we perish." Nazareth is a snuggle of clay houses on the hillside. Its carpenters today still use the simple tools that Joseph taught Jesus how to handle. The women still draw water from the well known as Mary's Well for as long as anyone can remember. And donkeys, piled high with burdens, sometimes carrying a mother and child, still travel the Galilean roadways. At Jerusalem, a city divided between Jew and Arab, between the land of Jordan and the state of Israel, I was permitted to cross through the Mandelbaum Gate, past the tangled barbed wire, roadblocks and battle-scarred ruins that mark the frontier. Most of the New Testament sites are still subject to historical challenge. They were first located by Helena, elderly mother of Constantine, who in the fourth century became Rome's first Christian emperor. Helena relied partly on local lore, chiefly on visions; but most scholars today agree that her selections, if they don't mark the exact places associated with events in Christ's life, are reasonably close. Historians have concluded that the Christian calendar is wrong, that Jesus was probably born seven years earlier than the date from which we now reckon our centuries. The mistake in our calendar, attributed to a monk named Dionysius Exiguus, means we are really living in 1969. Thus the Star of Bethlehem should have appeared in 7BC. A few years ago, scholars deciphered some observations of the ancient School of Astrology at Sippar, Babylon, reporting the conjunction of Saturn and Jupiter within the constellation of Pisces in 7BC. The planets moved so close to one another that they appeared from earth to have a rendezvous in space. From the Holy Land, according to mathematical calculations, the conjunction should have looked like one large brilliant star. It is also known that Jewish wise men studied at the Sippar School. These ancient astrologers, according to the rabbinical writer Abarbanel, believed the Messiah would come when Saturn and Jupiter met in the constellation of Pisces. It is easy to understand how this celestial event in 7BC, might have stirred three wise men to journey from Sippar to Palestine in search of the Christ. The conjunction would have appeared as a single bright star in front of them as they headed south toward Bethlehem. Or, as St. Matthew so vividly relates: "And lo, the star, which they saw in the east, went before them". For centuries, Bible students were troubled over St. Luke's report that the Christ Child was born "when Cyrenius was Governor of Syria." The only available records indicate that Cyrenius did not take over as legate to Syria until AD6. But a fragment of a Roman inscription, discovered recently at Antioch, reveals that the Emperor Augustus also sent Cyrenius to Syria on an earlier occasion. Indeed he was legate of Syria between 10 and 7BCat the time of the spectacular conjunction of Saturn and Jupiter over Bethlehem! The Roman governor during Jesus' ministry, as every Christian knows, was Pontius Pilate. He kept his official residence at Caesarea then the chief port of Rome's eastern colonies. Today, archaeologists are unearthing Caesarea's ancient ruins on the banks of the Mediterranean. Here workmen recently dug out a cornerstone upon which these words are still clearly visible, in Latin: "Pontius Pilate, Governor." Pilate would have been overlooked by history, except for the dramatic way in which he figured in the Life of Jesus. St. John describes one scene in these words: "When Pilate therefore heard that saying, he brought Jesus forth, and sat down in the judgment seat, in a place that is called the Pavement, but in the Hebrew, Gabbatha." The Aramaic word "Gabbatha" means "raised ground." In Old Jerusalem, archaeologists have discovered a large, flat pavement of nearly 3,000 square yards built in the Roman style of Jesus' time. It is located upon a rocky eminence, or "raised ground." Here it was almost certainly that Jesus stood before Pilate while the mob howled. Upon this pavement, too, the cruel scourging took place. Then Pilate delivered Him to be crucified. After the Crucifixion, the Saviour was laid in a great sepulchre which St. Matthew described as a new tomb "hewn out in the rock." Over 1,000 graves have been dug up in Jerusalem that can be traced back to this period. All were located in cemeteries or family vaults, except one. Some archaeologists believe this lone tomb may have been the resting place of the crucified Christ. Finally, modern findings bear out the fulfillment of some of Jesus' prophecies. He sadly foretold the doom of Capernaum, where He had begun His ministry. "And, thou, Capernaum, which art exalted unto heaven, shalt be brought down to hell," He cried. Of Jerusalem's inhabitants, Jesus warned: "And they shall fall by the edge of the sword, and shall be led away captive into all nations." It happened as He had said. [And on April 29, 1965 when Brother Branham preached "Choosing a Bride" at the Full Gospel Business Men's Convention at the Biltmore Hotel Auditorium in Los Angeles, the city in which a revival initiated the Laodicean Church Age in 1906, He cried: "That is solemn warning. We don't know what time. And you don't know what time that this city one day is going to be laying out here in the bottom of this ocean. Thou city, who claims to be the city of the Angels, who's exalted yourself into heaven and sent all the dirty filthy things of fashions and things, till even the foreign countries come here to pick up our filth and send it away, with your fine churches and steeples, and so forth the way you do; remember, one day you'll be laying in the bottom of this sea. Your great honeycomb under you right now. The wrath of God is belching right beneath you. How much longer He'll hold this sandbar hanging over that, when that ocean out yonder a mile deep will slide in there plumb back to the Salton Sea. It'll be worse than the last day of Pompeii. Repent, Los Angeles! Repent the rest of you and turn to God. The hour of His wrath is upon the earth. Flee while there's time to flee and come into Christ" (Choosing a Bride, p. 35:3-5; The full name of Los Angeles is "El Pueblo de Nuestra Señora La Reina de Los Angeles de Porciuncula" which means 'The Town of Our Lady Queen of the Angels of Porciuncula' - Ed)]. At the north end of the Sea of Galilee, where the shore curves into a small bay, a few broken stones and pillars rise out of the grass. The shattered columns and strewn stones are all that remain of Capernaum". Of Jerusalem's inhabitants, Jesus warned: "And they shall fall by the edge of the sword, and shall be led away captive into all nations." It happened as He said. [And it will happen as He said through His Prophet, William Branham  Ed]. That part of the population not massacred in the bloody Jewish war of 66-70AD and the Bar-Kokhba rebellion of AD132-135 were sold into slavery. [The assumed name of this Messianic imposter Simon Bar-Kokhbah, leader of the Jewish rebellion against Rome in about AD135-137, means 'Son of the Star' - Ed]. Archaeologists have found no material evidence of Israel's existence after this periodnot even a tombstone with a Jewish inscription.